With the prohibitively high cost of office space in many locations throughout North America, many business owners are turning to storage units as viable alternatives to office space. A storage unit, while seemingly unconventional, can provide ample space and comfort from which to conduct business, but there are some design and decorating tips that might make the transition from a more traditional office space a bit more comfortable. 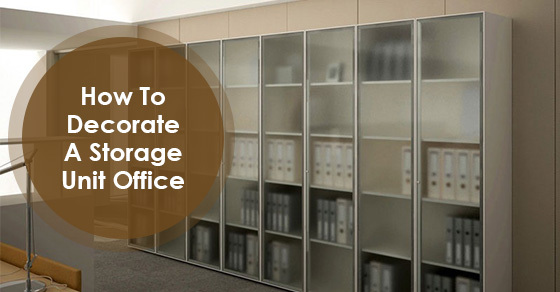 Below are five ways to decorate your storage unit office. Window frames. Most storage units are windowless, meaning that if you plan on working from it on a regular basis, you are going to have to get used to the lack of natural light. A good way to create the illusion of natural light in your storage unit office is to purchase some window frames, insert landscape artwork or photography into them and back light them. Throw carpets. Most storage units are also entirely concrete or concrete and metal. This is great for keeping out moisture and keeping your belongings secured, but not the most inviting material. A couple of throw rugs with warm colours can quickly change the entire mood of a storage unit office and make it feel more inviting. Artwork. This pertains to the above point about the concrete. You are going to want to make the unit feel as peaceful as possible, and once again, concrete does not typically scream “peace.” Having some art on the walls or pictures of your family is a good way to ensure that you have more to focus on than just the four concrete walls around you. A fish tank. Fish tanks generally look great in any office setting, but having something that brings light and life into an area that is generally not associated with either of the two can transform the entire ambience of a storage unit office and make it feel more alive. Just make sure to check with the facility that they allow water and tanks on the premises. Bright colours. Full spectrum lighting. Full spectrum lighting is a known cure for depression and the winter blues because our bodies naturally crave the full spectrum of light that they receive from the sun. Any lighting or lamps that you have in your storage unit office should take this into consideration. You don’t need all of your lighting to have this, but your taller lamps, which cast the widest light should incorporate this strategy into your decorating. A self-storage unit office can seem like a foreboding concept, but with the right touches of light, and theme, you can turn a self-storage unit into a viable, inviting workspace that saves you money, and provides a great alternative to expensive, traditional office space. Keep the above five decorating tips in mind and design a self-storage office space that lets you work and thrive.